Primo: You know how LinkedIn is always pestering you? Primo: I never do anything on LinkedIn, but I clicked through to the "People you may know" section. Primo: They suggested I connect with [my opponent]! Primo: So I clicked through to look at his profile and I accidentally sent him an invitation to connect! Yup! I will be in town. Also I saw the sign for Primo around the neighborhood. Good luck! I plan on voting for him! Primo: There's one thing I haven't been procrastinating on. Primo: There is nothing worse than doing a campaign finance report at the last minute. Primo: So as I have been getting contributions, I have been adding them. Me: Instead of staying up all night the day before the report is due? Me: Who ARE you? And what have you done with my husband? What a grueling and grotesque campaign this has been. Given my level of agony and disgust, I'm well aware that yours is infinitely worse. I'd like to make a contribution to Primo's campaign; however I don't wish to put it on a credit card. Would you please let me know how to do so by check -- name of payee line and address to which it should be sent. I hope that Primo has a chance to be the victor rather than the perennial sacrificial lamb. Please keep me up-to-date. Wishing you both fortitude and victory!!! Primo: You know that guy who called me for an interview? Me: Umm. Yes. Of course. Primo: The article was printed today. He made some mistakes. Primo: Instead of writing that I am a "chip designer," he says I am a "ship designer." Me: At least there is not a big difference between designing microchips and designing ocean-going vessels. Primo: Politician X gave $100 to my campaign last night. Me: Wow! That's really nice. I think he's a total sleazeball, but that's nice of him to contribute. Primo: He gave $1,000 to [Candidate Y], too. Primo: She won her primary in August and is running unopposed. So she doesn't even need the money. Me: That seems kind of - unbalanced. Primo: I have done doors for him. I have helped him a lot. I have contributed to his campaigns. Me: Did he at least contribute as much to you as you have given to him? Primo: So now I know where I stand. Me: So you're not going to give him more money or help? Primo: I got vaseline on my pants! Primo: I was at Sandy's house and she wasn't home but one of her [Senate candidate's] signs was crooked so I straightened it out for her. Primo: And she had put vaseline on it because there have been some sign-stealing incidents on her street! Me: That's what you get for meddling with someone else's business. Primo: I wasn't meddling! I was trying to help! I was doing the right thing! Me: And you are not seeing a problem with this? Primo: It was the right thing to do! Primo: Will you clean the stain off my pants? Me: No, but I will tell you how to do it. Primo: No! I want you to do it! Me: That's OK. I'll just tell you. Primo: But - but - I don't have time! I'm busy! Me: Oh, and I didn't spend all day working? Primo: But you already know how to do it! Primo: And you're already good at it! Me: All you need is practice. Primo: But - but - but - it's not something I should need to know how to do. It happens so rarely. Primo: It's your telling me I need to learn how to bake an apple pie. You're already so good at it that there's no reason for me to learn how. Me: Now you are advocating for division of labor and specialization? Me: Kind of ironic that the only time you are in favor of free market policies is when they benefit you. At least I have not had to shave my legs lately. Why bother? to which I say, "Did you ever email the people who volunteered on your last campaign?" to which he answers, "No." And I say, "Have you emailed people you have met during this campaign who expressed an interest in helping?" Then I ask, "Have you asked the people whom you have helped on their campaigns to help you?" 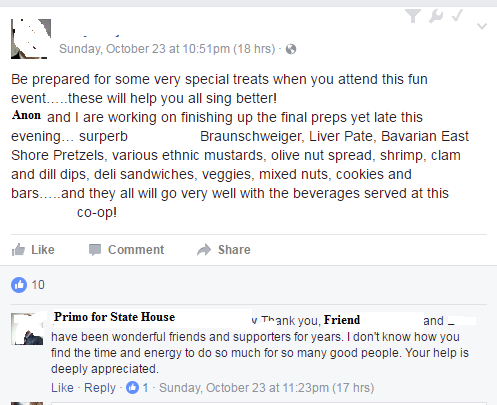 Which makes me wonder what kind of elected representative Primo would be if he is not willing to ask people for stuff. It seems that once elected, all politicians ever do is ask for more money and more time and more more more from people THEY SHOULD BE LEAVING ALONE. Dang. Once you are elected, go do your dang job. Quit asking for more money. Quit it. One of the things I like about Primo is he is not a grabby, asky person. However - one email to people who might want to help him - something like, "Dear person who wants me to be elected - would you please help me by doing doors for one afternoon/distributing ten yard signs/donating ten dollars to my campaign?" That? That would not be so awful. One email. Just one. Not pushy. To people who had already expressed an interest. But that's not how Primo rolls. I guess that's good. I guess I won't ever wake up to discover that Primo has been taken by the feds for running some Ponzi-scheme operation from our basement. Primo: I saw some guys at K's party last night. They said I should have an election night party. Primo: I don't think my campaign is important enough for that. Me: If they want to host a party at their house, that's fine.